Politics | Afterthoughts & Other Things . . .
Bricks through the windows of the office of politicians. Screaming “You lie!” at the President in a joint session of Congress. Death threats against members of Congress. Screaming “baby killer” or something thereof while an opposing member of congress has the floor. 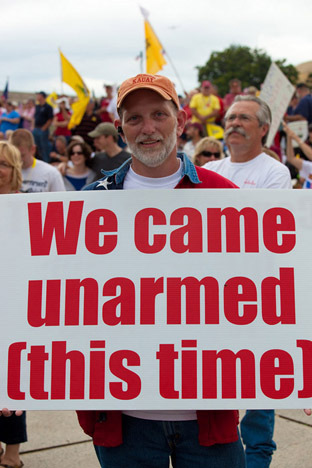 Using the term “teabaggers” when referring to members of the Tea Party movement. And this is just the tip of the iceberg! All this and more has been happening for the better part of the last year and has picked up steam since last Tuesday’s signing of the health care reform bill. The problem with all this . . . many of those participating and leading the charge label themselves as Christians. This is where the difference between a label and actually obeying Christ comes into play. I think many who go by the name of Christ have crossed the line in their speech and perhaps in their actions. I hear really angry rhetoric all the time when it comes to our president or various leaders of our government and this anger spills over to hateful, really uncivil comments that even the ungodly recoil at when they hear it. What place does this type of speech have among us? What does this type of speech reveal about the hearts of those who speak it? Christ said that what proceeds from the mouth reveals our hearts. How can we say we love Mr. Obama when we speak so harshly about him? Would these people ever say any of this stuff to Mr. Obama’s face if given the chance? I doubt it. There in reveals the false bravado of the WWW and the duplicity that lies in our hearts. Again, Christ calls us to speak truth IN LOVE to those needing to hear it before (if ever?) taking such comments publicly. Am I saying I agree with all the policies, laws and opinions? No, I don’t agree with it all. But I don’t think my differing opinion gives me the right to assassinate the character of others or to make statements like, “I’m coming disarmed . . . this time.” (did ya see the pic?) How do comments like that help progress civil dialog and hopefully lead to a hearing for the Gospel? Or is that point? That our political opinion has taken precedent over the opportunity for the Gospel? If your political opinion has become more important than the Good News you may call yourself a Christian but you are not a follower of Christ.